The model 5184 is a medium input impedance, AC-coupled, voltage preamplifier which features an ultra low-noise input stage. It has a frequency response from 0.5 Hz to 1 MHz and a fixed gain of x1000 (60 dB) and incorporates a special pseudodifferential input stage that can be floated to give the ground loop immunity normally associated with true differential inputs but without the associated noise penalty. It can be powered from its own internally housed (alkaline) batteries, an external low voltage supply (±15 V or ±18 V) or from the model PS0108 remote line power supply (optional extra). This preamplifier can also be powered from most of our range of lock-in amplifiers. 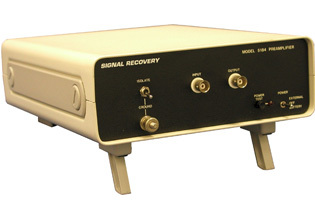 The model 5184 is ideal for use with medium impedance cryogenic sources and IR detectors, such as HgCdTe, InSb and InAs. AC coupled voltage amplifier with fixed x1000 (60dB) voltage gain and a maximum frequency reponse extending from 0.5 Hz to 1 MHz. Pseudo-differential input and single-ended output via BNC connectors. Modes Asymmetrical differential. Front panel ground terminal provided.